Arsenal host Everton at the Emirates on Saturday evening, with all eyes on whether or not the Gunners will unleash their two January signings. 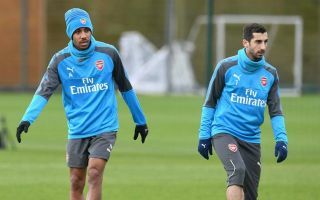 As noted by The Daily Mail, Henrikh Mkhitaryan and Pierre-Emerick Aubameyang have been reunited in north London after their previous stint together at Borussia Dortmund. Combine them with Mesut Ozil and Alexandre Lacazette, and Arsene Wenger has quite the attacking unit at his disposal, albeit it remains to be seen whether or not we get our first glimpse of them this weekend. What is certain is that Arsenal will have to produce a better performance this time round compared to their lacklustre effort in midweek against Swansea City, a defeat that leaves them in sixth place in the Premier League table and eight points adrift of the top four. Having won just two of their last six in all competitions, the Gunners must pick up their form between now and May to ensure that they have a successful end to the campaign. As for the visitors, former Arsenal ace Theo Walcott scored twice in a 2-1 win over Leicester City and he may well come back to the haunt his old club if he can maintain that impressive start to life with the Toffees as he helped end a seven-game winless streak in all competitions. As noted by The Sun, Aubameyang could be a doubt to feature due to illness, although he was seen training with his new teammates this week and so will have to be a late call. Jack Wilshere was missing in midweek for the same reason and so it remains to be seen if he recovers in time, while there should be a first home appearance for Mkhitaryan after he came off the bench against the Swans. Arsenal: Cech; Bellerin, Koscielny, Mustafi, Monreal; Xhaka, Wilshere, Ramsey; Mkhitaryan, Lacazette, Ozil. Everton: Pickford; Kenny, Jagielka, Keane, Martina; Walcott, Davies, Gueye, Rooney, Sigurdsson; Calvert-Lewin. Mesut Ozil. For all the talk of new signings, there will be real pressure on the shoulders of the German playmaker after he penned a new £350,000-a-week contract this week, as per The Guardian. The 29-year-old has been in good form this season, scoring four goals and providing seven assists in 20 league appearances, and while Mkhitaryan and Aubameyang will likely need a bit of time to find their feet, Ozil has to step up and deliver now. Arsenal 2-1 Everton. Arsenal have conceded 34 goals in 25 league games so far this season, giving them the joint worst defensive record of the top eight sides in the top flight. In turn, it’s always difficult to predict that they will keep a clean sheet, but they should have enough firepower to see off Everton, get back to winning ways and lift spirits on the pitch too.